Fear Factory with Shadows Fall for the Noise in the Machine Tour. 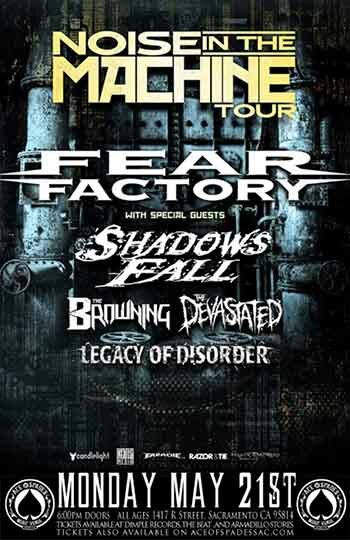 Fear Factory teamed up with Shadows Fall for the Noise in the Machine Tour. Joining the two bands on the bill were the Browning, the Devastated and Legacy of Disorder. This was Fear Factory's first tour with their new bassist Matt DeVries and was in support of their eighth studio album, The Industrialist. Shadows Fall released their seventh studio album, Fire From the Sky, in May of 2012 through Razor & Tie.